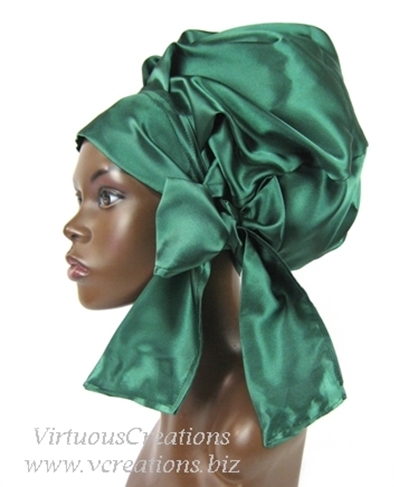 Here's a satin sleep cap just for you! Attention all naturals, those who have straight hair, wavy hair, long hair, short hair, anybody with hair. Finally, a sleep cap just for you! Introducing VirtuousCreations' Sweet Sleep Slumber Caps. This is the last sleep cap that you will ever buy! It is 100% handmade using a satin, silky and very comfortable charmeuse fabric which allows the hair to breathe and retain its' moisture as you slumber. It can be securely tied on either the front, back or the side of your head. No need to worry about losing it during the night because once it is tied, it stays on your head all night long. The 3 inch band across the front holds your edges nicely in place and provides extra reinforcement. This is not your ordinary sleep cap, not only is it a sleep cap, it is fashionable enough to wear when you are out and about. Yes, you can go right from the bedroom to enjoying your day to day activities without missing a beat. You can even condition your hair, put on a plastic cap, put your VC SSSC on over it and go about your daily activities. Small-Med: Your hair is from short short to the middle of your back. Large-Xtra Large: Your hair goes beyond the middle of your back.